What pressures are you under right now? What difficulties are you facing? And how are you coping with them? For many of us, our approach to adversity is predictable. Some of us tense up and become harsh, some of us try our best to ignore the issue and hope it goes away, others give up and tolerate what’s happening. And there are those, whom I admire, who seem to find a way to rise to the occasion with focus and clarity and make the most of a bad situation – or in fact, turn it into a win for them. For those of you who have not seen it, the story of The Carrot, The Egg, and The Coffee Bean, written by an unknown author, is a great little story that makes a perfect analogy about the choices we make when faced with difficulty. When you face hard times, which one are you – a carrot, an egg, or a coffee bean? Read on and find out. Her mother took her to the kitchen. She filled three pots with water and placed each on a high fire. Soon the pots came to boil. In the first she placed carrots, in the second she placed eggs, and in the last she placed ground coffee beans. She let them sit and boil, without saying a word. In about twenty minutes she turned off the burners. She fished the carrots out and placed them in a bowl. She pulled the eggs out and placed them in a bowl. Then she ladled the coffee out and placed it in a bowl. 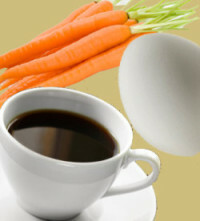 Turning to her daughter, she asked, “Tell me, what do you see?” “Carrots, eggs, and coffee,” she replied. Her mother explained that each of these objects had faced the same adversity – boiling water. Each reacted differently. The carrot went in strong, hard, and unrelenting. However, after being subjected to the boiling water, it softened and became weak. The egg had been fragile. Its thin outer shell had protected its liquid interior, but after sitting through the boiling water, its inside became hardened. The ground coffee beans were unique, however. After they were in the boiling water, they had changed the water. Are you the carrot that seems strong, but with pain and adversity wilts, becomes soft, and loses strength? Are you the egg that starts with a malleable heart, but changes with the heat? Does your shell look the same, but on the inside are you bitter and tough with a stiff spirit and hardened heart? Or are you the coffee bean? Actually changing the hot water, the very circumstance that brings the pain. When the water gets hot, it releases the fragrance and flavor. If you are like the bean, when things are at their worst, you get better and change the situation around you. When the hour is the darkest and trials are their greatest, do you elevate yourself to another level? How do you handle adversity? Are you a carrot, an egg or a coffee bean? It’s a nice story, however, when it comes to defining oneself, it’s easy to say “I’m this or that”… what truly determines a person is “consistency”. A person may handle a certain adversity well but next time, crumble. This is because problems come in different forms and degrees, hence, one should have the stamina in terms of aspiration, confidence and support system to continue to face life’s battles. We are ALL coffee beans at one point, but a TRUE coffee bean is one who has the “courage” to change the traditional way of doing things, of stepping out of the status quo… and in our case, in terms of business operations. For instance, “work experience” is simply repetition which means one is exposed to the same situation most of the time where if there are changes it’s only slight and if ever it’s heavy, it comes only once in a blue moon. Therefore, more valuable than experience are… brains, character, enthusiasm, adaptability, and good health. It’s the body that takes in problems, the heart that withstands adversity, and the head that solves them. Thank you for your thoughtful response — you make a number of good points. I agree that our ability to deal with the many faces of adversity has a lot to do with what we’ve dealt with in the past, our inner fortitude, attitude, and the support system we can tap into when needed. And yes, sometimes being the coffee bean takes courage! I agree with Jesse Domingo. Consistency is really hard! It’s really easy to say…but quite another thing TO DO those things consistently! CONGRUENCY in life is what I would really aspire to achieve and I love coffee…so it is a lovely way for me to remember it! Thanks! Thanks for your comment, Reina. Yes, consistency can be hard to achieve, and congruence is a powerful aspiration to carry us through. The coffee bean metaphor is a great way to remember it! Thank you!…even though I am now retired…it’s still something to achieve in our life journey! And having my daily cup of coffee with my wonderful husband, while I enjoy the birds and nature…is truly the best!! !